The highlight of my past year away from home was Wednesdays at the Awakin Circle in Santa Clara. The silence kept me grounded; the noble friends nourished me with hugs, kindness and wisdom; Harshida Auntie's cooking and generosity filled my belly with love. No matter how busy I was and how far the commute was, I would plan my schedule around Wednesdays. I could never find the right words to describe my experience at an Awakin circle and found it easier to bring friends and coworkers to see for themselves. Whenever I was in Toronto, all I would do is tell stories of my new Servicespace friends and Wednesdays. More and more friends back home were reaching out to chat about meditation or how to develop courage to get started on labour of love projects. I told my boyfriend I wanted to bring the Awakin Circle back to Toronto and he said if that was what was needed for me to move back home, he would support me in any way!! I asked for his help to come observe what happens in Santa Clara so that we can open up our home. That night, my boyfriend sat for his first hour of meditation...ever and Nipun gifted me a box of smile cards for Toronto. On my last Wednesday before leaving the Bay Area, I met Sachi who spoke about how she brought Awakin Circles back to India and I was moved... one step closer to starting the circle. As I left the retreat straight to the airport, I was buzzing from spending four days with the most inspirational friends I'd ever met. As I rambled on to a good friend at the airport as to all that transpired, she said..."Thu, you found your tribe!!" In the week before our first Wednesday in Toronto, we reached our capacity of 15! And so I went to Value Village, a second hand shop, which had all the utensils I needed - It was even cheaper than it'd cost to get disposable stuff. Dustin confirmed he was coming from Santa Clara and I asked him to start the opening reflections (for which there's detailed instructions on how to!) We picked out our favourite passage together and he set out to reflect deeply on his free fall. So many invisible hands of Servicespace supported in every way possible every day leading up to the circle. 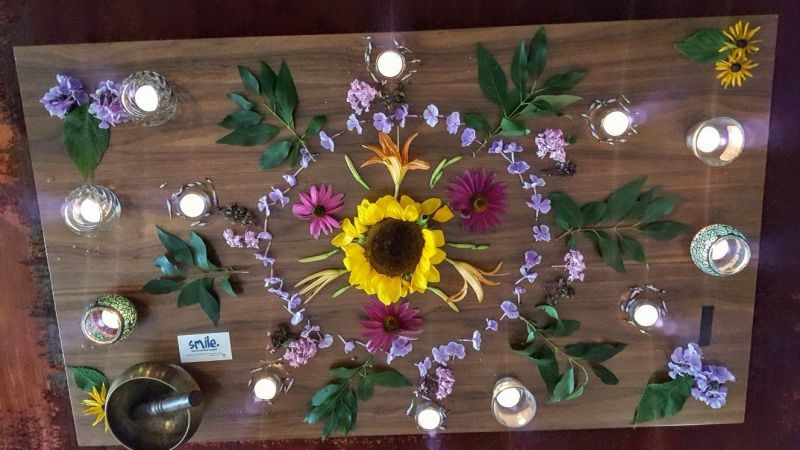 My friend Alcina saw photos of beautiful mandala arrangements from the Servicespace retreat and was inspired to go to her mother's garden to pick flowers to create a beautiful arrangement for our first circle!! Wednesday August 9th arrived and Dustin and I set out to go grocery shopping to prep. After getting recipes from Trishna and Preeta, I was inspired to make a simple menu of salad, rice, and two curries: spinach daal and aloo gobi. We completed it in the afternoon (with the help of my instant pots) within 2 hours! A few friends arrived 30 min early and we had plenty of hands to bring everything down to our party room to prepare and create a circle. As friends started arriving, magically everyone was able to navigate through the maze of the condo entrance to the locked party room door. We found enough pillows and couch space for everyone as we settled into an hour of silence. In the second hour, Ming read the passage we picked out and Dustin started with a deeply relatable share about his brave free fall. I sat back and watched the magic I had experienced in Santa Clara, happen right here, in my hometown of Toronto. Each share around the circle was deeply genuine, vulnerable, honest, and many nuggets of wisdom flowed into the space. I was always curious if it was a localized Bay Area phenomenon to find deeply introspective people who'd be up for sharing vulnerability and wisdom, but I realized it could be replicated here too!! Everyone present had an innate ability to hold space for everyone else. When it was my turn to share, the fire alarm went off. Phew... While I convinced the property manager it wasn't our candles that caused it, we rolled with the punches and moved into the dining room for dinner. What a joy it was to see all the smiles and laughter in a room full of strangers, speaking about life long dreams, ambitions, struggles, acts of kindness. At the end, we even arranged impromptu carpools so that nobody had to go alone. From start to finish, it was so effortless - bringing my favourite way to spend Wednesday back from Silicon Valley, being with friends, sharing and discussing what was important and sharing delicious food. I was up buzzing all night, thinking of all the wonderful friends that laddered me from the west coast and new friendships that blossomed that night. I So many heartfelt emails and texts came! What a blur that line is between giving and receiving - I received so much in hosting this first Awakin Circle. I thought about when, if ever, have I brought people together with no strings attached - no event to celebrate, no fundraising to do, no obligation of any kind except to hold space to whatever emerges. What a shift and difference it makes, to do something without any expectations of the outcome. I'm writing this just a week before our second Awakin Circle in Toronto (Which is currently is over-capacity at 17 RSVPs!) Having learned of the "No Exit Strategy" at Servicespace, the commitment to keep up a collective practice no matter how small. I really don't think I've ever approached something committing to a continuity of a lifetime (or many) before saying yes to hosting an Awakin Circle. So I look forward to welcoming you to our home and will be sure to share the slow stories and ripples that will emerge here in Toronto. What a privilege it was to help you get this started, Thu, and witness the magic that emerged that evening. Looking forward to hearing more great stories from the Toronto Awakin Circle! I love Awakin stories :-) Thank you for sharing.